Do you remember Rebekka?! She was my very first college roommate, and holds a special place in my heart. Now, she and her husband Manley are raising support to adopt a sweet little girl (Beda) from Ethiopia. Rebekka has been busy whipping up these adorable child-sized aprons to sell on her website, and is now offering matching adult-sized aprons! You can help fund her adoption by visiting her website, and purchasing a sweet li'l apron or two. If the one you love is 'Sold Out', be sure to check back, because the site is updated frequently. If you want to get to know Rebekka, or follow her through the adoption process, visit her beautiful blog. You may get to peek at the new loft she and Manley just purchased in Nashville! I have added an 'Aprons for Beda' button to 'So Pickin' Cute', so you can easily find the apron shop if you come back for another visit. 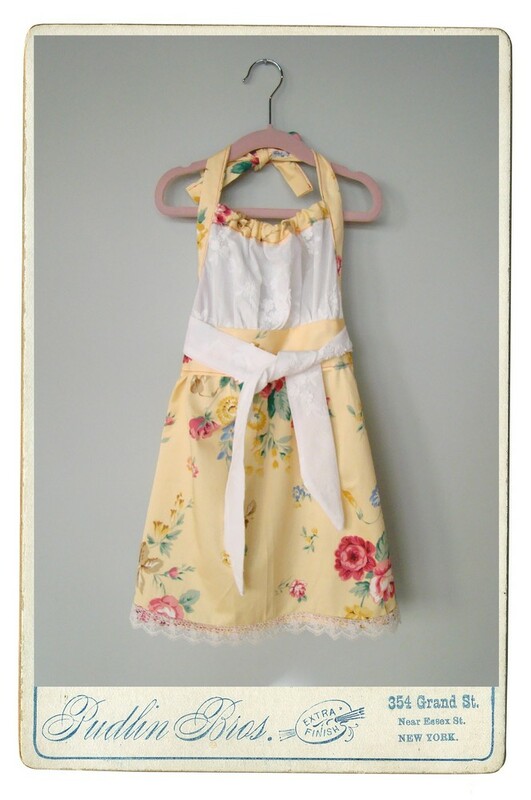 I just purchased this sweet little yellow apron for Kalia, and can hardly wait to see it! 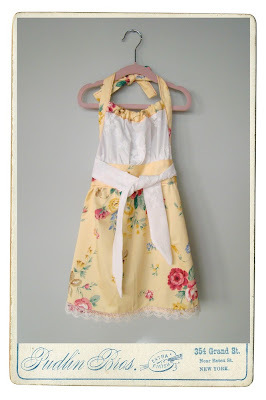 Be sure to read the descriptions Rebekka included by each apron...they are so endearing! Awwww thanks Abby! I was so excited to see you bought the yellow one...I actually thought you might like that one! I really, really want to see a picture of Kalia in it if you ever get a chance. Heck, I'd just like to see a picture of Kalia period!!!! Thanks so much for buying and for posting this. You're awesome!!! Rebekka, I LOVE it...and can't wait 'til it arrives!!! I will definitely try to get a photo to you. I haven't taken a picture for several months -- pretty sad!!! I am just a random person but I had started following Dear Friend and Aprons for Beda because I loved Rebekka's style and the fact that they were trying to raise money for adoption. But now the store and the blog are all gone. It's not my business as to what specifically happened but...What Happened??? Actually, Rebekka started a NEW blog on wordpress (http://rebekkaseale.wordpress.com). She is no longer selling aprons, but opened an ETSY shop to sell her artwork instead. The link is on her new blog.